Rigoroso has a steady stream of return customers buying his microgreens at the Broome County Regional Farmers Market on Saturdays Image Credit: Jonathan Cohen. 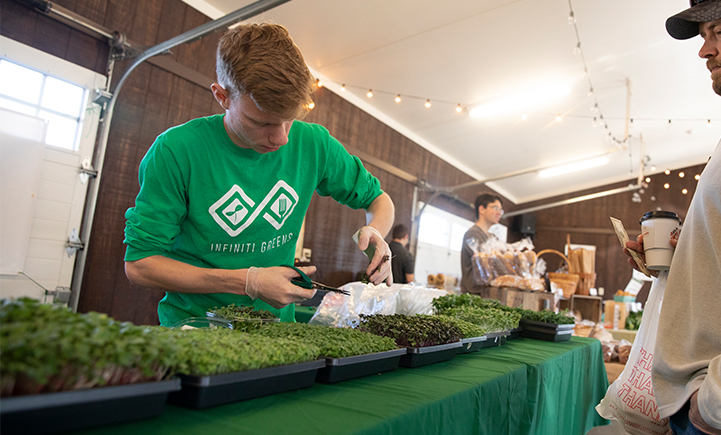 Rigoroso has a steady stream of return customers buying his microgreens at the Broome County Regional Farmers Market on Saturdays Photography: Jonathan Cohen. At a time when many startups are focused on apps, algorithms or artificial intelligence, Joseph Rigoroso is finding success by going the low-tech route: He grows microgreens. During what he calls a “factory tour” of his business, Infiniti Greens, at its home in the Koffman Southern Tier Incubator in downtown Binghamton, Rigoroso pinches a few sunflower leaves from a seed-starting tray crowded with inch-high seedlings and offers them up to be tasted. They do, in fact, taste just like sunflower seeds, but without the pesky shells. The cilantro, basil, radish and red cabbage leaves pack an intensity of flavor that is out of proportion to their size. They are delicious. Joseph Rigoroso '18 Image Credit: Jonathan Cohen. For about a year, Rigoroso has been selling the microgreens to local restaurants and at the Broome County Regional Farmers Market, where he has a steady stream of return customers. And now that he’s graduated, Infiniti Greens is no longer the side business he ran while earning a degree. It’s his full-time job. Rigoroso grew up on Long Island, where his dad was the family’s gardener until chauffeuring duties for his younger children got in the way. So Rigoroso gave up his video games and took over the garden — and loved it. When it came time to apply to colleges, he wasn’t enthusiastic. “I really wanted to do my own thing, but I didn’t know what that was,” he says. But his parents — both Binghamton alumni — insisted he visit their alma mater. “It’s a beautiful campus and it felt like a good fit,” he says. Then he was waitlisted. On the final day possible, he was accepted into the School of Management. Rigoroso started growing basil and cilantro in his room. “It’s kind of hard to grow herbs indoors. I grew basil all year long and had enough for one chicken parm,” he says. Then he learned microgreens could give him a weekly harvest and will grow year-round. “Initially I did it for myself to save money, have fun watching them grow and know where my produce comes from,” he says. The more he learned, the more he began to see them as a viable business. In spring 2017, he took his idea to Antonio Frontera’s entrepreneurship class, where he won seed funding for his seedlings. “In the class, you design a business plan. The best five compete, and one wins $5,000 given out over two years. That’s where Infiniti Greens started,” he says. Frontera is a lecturer in the School of Management and entrepreneur-in-residence with the Southern Tier Startup Alliance. He teaches would-be entrepreneurs how to identify if there is a market for their service or product. “What puts startups out of business is not having a market for the product. That’s what we do in my class and at the Koffman Southern Tier Incubator; we study the customer and market first, to see if there is a need in the market,” he says. That means going out and talking to people, Frontera says. And yes, it’s hard. His students have to talk to between 30 and 40 customers, asking questions to prove a hypothesis without telling the customer what their product is. Rigoroso signed on for an independent study with Frontera in spring 2018, Rigoroso’s final semester before graduating. One year into its existence, Infiniti Greens has evolved into a bourgeoning business. “We started out with the big numbers and big dreams in our business plan, and now we’re coming out with more realistic numbers and a more realistic business plan,” Rigoroso says. For example, some thought was given to building greenhouses. But at this stage, Rigoroso grows all the microgreens he can sell inside a wet lab at the incubator. The seeds are ordered from Page Seeds in nearby Greene, N.Y., and sown in regular potting soil. Because the greens are harvested when they sprout two leaves, the plants don’t suffer from being too crowded in the tray. And they don’t need special grow lights. Rigoroso’s biggest challenge this year is figuring out how to scale up his business, Frontera says, but working in his favor are his passion and desire to succeed. “He’s really into nutrition and healthy lifestyles and he’s a hard worker. Entrepreneurs get in there and work hard until they can start hiring,” Frontera adds. While Frontera teaches entrepreneurs how to listen to potential customers as a means of gauging demand for a product, business competitions force them to learn how to pitch to investors. This spring, Rigoroso attended multiple business plan competitions. Infiniti Greens was one of just 25 to make it to the finals of the national e-Fest competition, and although it didn’t win, Rigoroso took away some good lessons. A week later, he went on to win first place in the Clean Technology/Sustainability category at the New York Business Plan Competition, earning $10,000 to invest in Infiniti Greens. From the second a seed is planted, Rigoroso is already running the numbers. All of his microgreens are grown in 10x10 inch square trays, and he knows exactly how much soil and seed to use for every variety, as well as how much light and water each needs. For example, a square of cilantro needs roughly 100 grams of soil, has a seed density of 15 grams and has a crop cycle of 15 days (one week for germination followed by eight days under the lights). Knowing exactly how much his costs are for each variety, he is easily able to calculate his expected profit from each square. 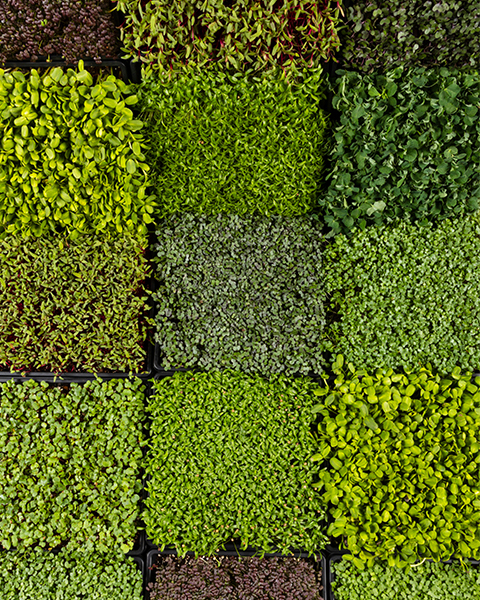 Among the benefits of growing microgreens is minimal outlay — plastic trays, seeds and dirt — and minimal waste: What can’t be sold can be eaten by Rigoroso, bartered for other foods at the farmers market or composted. But there is a lot of data to dig into, and Rigoroso’s business partner, Brianna Hulbert, helps track planting times, harvests, yields, time to delivery and more. “I can plug in that I’m planting 10 squares of arugula, and it has my costs calculated out. It has estimated yield per square in terms of money and plant grams (harvest size). Now we have a good sense of the time going into the square and how much money we can make from the square,” Rigoroso says. Rigoroso has big plans for his microgreens. Scaling up includes adding another dozen restaurants, branching out to other markets and selling kits so people can grow their own microgreens. He’s especially eager to get kits into schools. “Lots of schools have gardens, but if you’re planting them during the school year, kids don’t see the results in summer. With sunflowers, you can sow the seeds and eat the greens in a week,” he says. 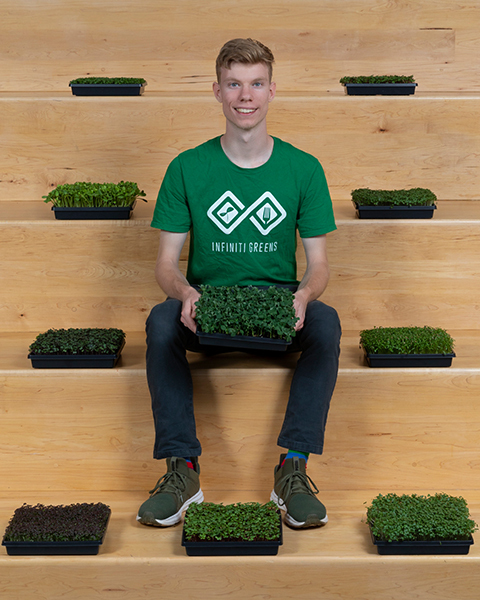 In addition to trying to get microgreen kits out in time for the holiday season, Rigoroso has a number of other business ideas that could carry him through the next 20 years or more. And all will allow him to stay in Binghamton.